Jack Jackson. Painting by Scout Stormcloud / The Rag Blog. Jackson left a large body of work behind that will assure that people will be reading and looking at his handiwork for as long as we have a world that cares about history, Native Americans, Texas, Mexico, or flights of graphic fantasy. See 'Jaxon, Drawn to the Task,' Video by Bob Simmons, Below. 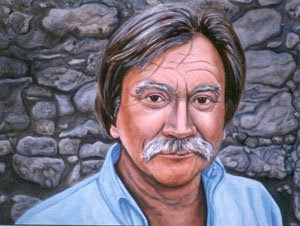 Jack Jackson, aka “Jaxon,” the famous Austin underground cartoonist and historian died back in August of 2006 by his own hand. He had been diagnosed some months earlier with cancer and some other nasty conditions to go with it. As for taking his own life, he might have decided that going through a prolonged battle to preserve what would be a tedious, at best, old age wasn’t worth the trouble or expense. I would not presume to second-guess Jack on this issue. It is something each of us may have to deal with in our own good time. The obituaries rolled in. Much tribute was paid, and more importantly, many true tears were shed. Jack had made a lot of friends over the years. If we lived in a fair and just world, then Jack should have left a valuable estate behind, for he was an enormously talented and hard-working artist, but he was never paid anything close to what he was worth. Call it the luck of the draw, combined with the fact that Jack was not one to compromise. He had a vision, and he was true to it. He worked alone in rooms, late at night, guided only by a sense of trying to honor some of history’s semi-forgotten underdogs like Juan Seguin, Quanah Parker, and the countless nameless native Americans who died in the North American holocaust, our own ethnic cleansing of the West. One can go to many sites, starting with Wikipedia for the full bibliography of his works. [Also see Jack Jackson on the Rag Author’s Page.] Suffice to say, he left a large body of work behind that will assure that people will be reading and looking at his handiwork for as long as we have a world that cares about history, Native Americans, Texas, Mexico, or flights of graphic fantasy. In 2008, the Texas State Historical Association held its annual meeting in Corpus Christi, TX, and I had the opportunity to speak about Jack, since we had been housemates and had both worked with Chet Helms and the Avalon Ballroom in San Francisco during the hippie heyday of the 1960’s. We had also both worked together on the Texas Ranger humor magazine in the early 60’s and had walked other similar paths. I prepared a little video presentation for the gathered historians, so that they would know him better. The room was full of academics and historians. Their interest in Jack was that he had come from such an unusual background, and was a classic autodidact or self-taught historian. My job was to show something of the ‘other’ world from which he had sprung. Of course I couldn’t get the video projector to work, so I got to talk about Jack for the assembled group. I managed to get through the event without notes, but who knows what I said, or if it was worth anyone’s time. So, now, after a lot of messing with various YouTube and Vimeo nonsense, I have managed to get the short video I prepared up on the Net. I want to share it with you, because everyone should know more about Jaxon, a real artist and hero of his time. The interview footage comes from Scott Conn’s “A Dirt Road to Psychedelia” and from an interview I did with Jack shortly before he died. Most of the artwork can be found in the Jaxon Collection at the Barker Texas History Museum at The University of Texas’ Center for American History under the care of our friend John Wheat. I'll take credit for most of the still photos, along with Bill Helmer, Burton Wilson, and a couple stills stolen off the web...call it 'fair use'. Jaxon - drawn to the task from Telebob on Vimeo.